When a phone accidentally falls in water, we normally run to get rice. It’s common lore that if your phone doesn’t turn on after getting dunked in water, you put it in rice. The logic here is that the rice will soak up the water, and your phone will work again. But rice can take up to three days to fully dry your phone, and even then it’s not guaranteed that it’ll work again. A company called TekDry is setting up electronics-drying locations around the US, where customers with wet gadgets come to dry them for $70 in special machines that literally pull the water out of them in a vacuum chamber. But if your phone doesn’t work because the water damage went too far, you won’t be charged anything. It’s a much better deal than buying a whole new phone. So far, you’ll only find TekDry locations in Colorado, Michigan, and New Hampshire, but they’re adding 82 more locations in California, New York, Philadelphia, and the greater Boston area in mid-October. In New York, two locations will be in Brooklyn, two in Manhattan, and two in the Bronx. TekDry’s machines can dry phones in 30 minutes with an 80% success rate if you bring it within 48 hours of getting your phone wet. Recently, it was discovered that Apple’s latest iPhones are much more resistant to water than previous generations. 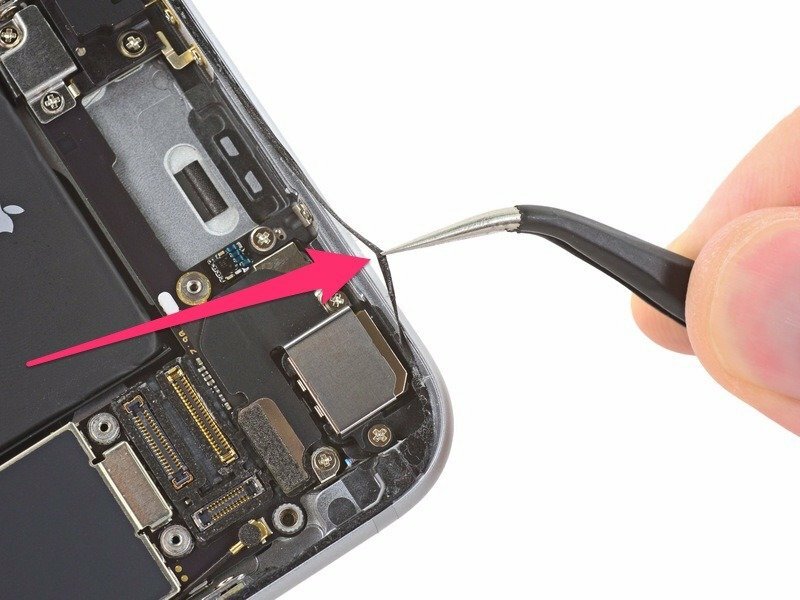 It turns out that Apple added gaskets around the edges and seals around important components into the latest iPhone 6s and 6s Plus to keep water out. The new iPhones survived a test where they were dunked in a shallow bowl of water for an hour, with only the 6s suffering from a diagonal line across its screen. So you might not need to worry if you drop a new iPhone into, say, a toilet bowl. Other phones boast water resistance, like Sony’s flagship line of Xperia phones. But others are doing away with the feature. Samsung, for example, recently did away with the water resistance in its line of Galaxy smartphones. TekDry also dries other devices, like tablets, laptops up to 13-inches, cameras, and basically any battery-powered portable device. When Apple took the wraps off the redesigned iPhone 6 and 6 Plus in September, some huge differences between the new phones and previous iPhones were immediately apparent. The screens on the new phones were bigger than those on any previous iPhone. The phones were also thinner and lighter. But most notably, unlike earlier iPhones, which had panels on the back made of ceramic and glass, the case of the newest iPhone was made of aluminum, save for some thin, plastic-like lines that run across the phone at the top and bottom of the device. 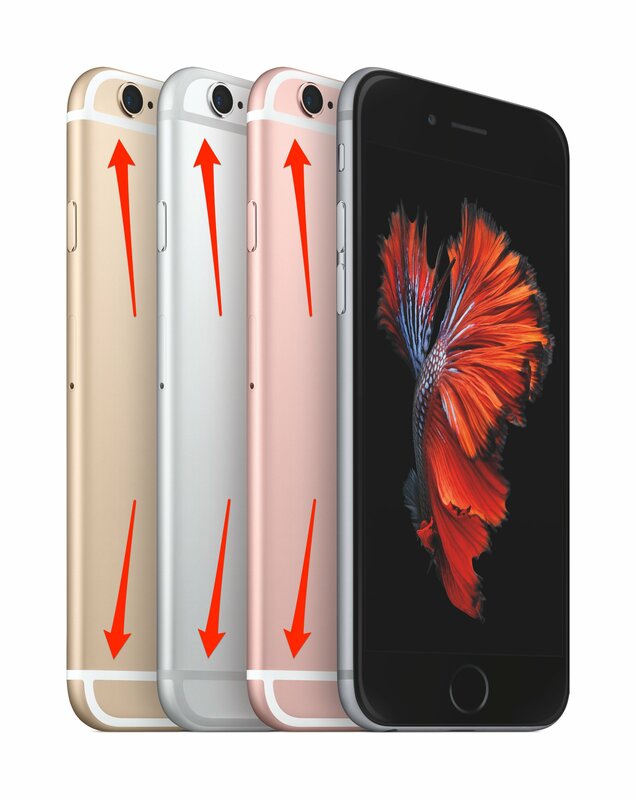 The lines are white on the gold and “rose gold” iPhone models, and gray on the silver and “space gray” models. Those strips are a source of consternation for some people, who’ve vented about their presence on Twitter. There’s even a discussion thread on the question-and-answer site Quora that asks if Steve Jobs would ever have allowed the phone to have them. Apple wouldn’t tell Tech Insider the purpose of the white lines, though the consensus among company observers is that they have something to do with the iPhone’s antenna or signal. To learn more, we reached out to Jeff Snyder, director of marketing at iFixit, a company that sells tools and parts and provides repair guides for people for how to fix their gadgets. iFixit is also known for doing teardowns — taking apart and posting the pictures — of new gadgets. We believe that the lines/bars on the outer case provide a clean escape route for the signal to get through the case. The iPhone 5 and 5s had glass sections on the back, both top and bottom, for the same reason — and the iPhone 4 and 4s had glass backs. Apple is likely looking into ways to eliminate this design feature from future iPhone models. The company filed a patent earlier this year for a composite material that will allow radio signals to escape. If you’re wondering when you can hear about Apple’s next iPhones and iPads, you might want to keep a weather eye on September 9, as a report indicates that’s when Apple could hold its biggest product launch of the year. According to Buzzfeed’s John Paczkowski, who has accurately reported on Apple launch dates in the past (this time citing the token “sources familiar with Apple’s plans”), the company will launch its next iPhones, iPads and Apple TV at a media event during the week of September 7 – with Wednesday, September 9 standing as the most likely day. While Apple has previously launched iPhones and iPads at separate events, the iPad’s prominence has dropped of late along with its sales, and the tablet will reportedly join the iPhone 6s and iPhone 6s Plus at the event. The report says the rumored 12.9-inch iPad Pro is a “wild card” for the event. Multiple sources have pointed to the next iPhones as having the Force Touch sensors found in the Apple Watch and recent MacBooks, as well as faster A9 chips and better cameras. That long-rumored Apple TV set has yet to materialize, but the updated Apple TV set-top-box that Apple is rumored to be announcing at the event may be the closest we’ll get. It allegedly has an A8 chip, overhauled OS, a remote control with a touchpad on it and Siri voice control. Even when sources have proven track records, you’ll always want to take these reports with a few grains of salt (and plans can change, even when reports are legit). But it also couldn’t hurt to grab your calendar and pencil in a big fat Apple logo on Wednesday, September 9. At the Black Hat conference on Wednesday, researchers revealed that fingerprint sensors on Android phones are vulnerable to hackers. Wiping your fingerprints won’t do you any good in this day and age. During the Black Hat conference on Wednesday, security researchers presented findings that reveal hackers can remotely obtain fingerprints from Android devices that use biometric sensors. At the moment, FireEye scientists Tao Wei and Yulong Zhang say the threat is specific to Android smartphones that use a fingerprint sensor, which limits the number of vulnerable devices. Though companies like Samsung, Huawei, and HTC currently produce Android devices with those sensors, Apple still has a significant hold on the market. Its Touch ID sensor has proven to be more secure because it encrypts data gleaned from the scanner. “Even if the attacker can directly read the sensor, without obtaining the crypto key, [the attacker] still cannot get the fingerprint image,” Zhang told ZDNet. Android users, however, are not so lucky: The researchers detected four methods of attack, the most disconcerting of which could remotely hack the sensor and steal any fingerprint that it encounters. Called the “fingerprint sensor spying attack,” it would allow a hacker to continuously use fingerprint data however they please. Wei and Zhang tested the hack on the HTC One Max and Samsung’s Galaxy S5 phones. By 2019, industry watchers predict that more than half of smartphones will have fingerprint sensors—which means phone makers must improve their device security. Ringly does this by connecting its rings to a smartphone filter so that users can silence Gmail or Facebook notifications while preserving crucial alerts, like text messages from a babysitter, which cause the ring to light up or vibrate. “Hopefully it will keep some distance between my phone and my hand,” said Ms. Butler, 27, who lives in Austin, Tex., and is a technology consultant for small businesses. Given how quickly cellphones have taken over our lives, it’s easy to forget that they are still a relatively new technology. The first iPhone came out eight years ago, and today a little more than half the American population has a smartphone, according to eMarketer. Yet already people spend close to three hours a day looking at a mobile screen — and that excludes the time they spend actually talking on the phones. In a recent survey of smartphone use by Bank of America, about a third of respondents said they were “constantly” checking their smartphones, and a little more than two-thirds said that they went to bed with a smartphone by their side. Those habits have prompted enough soul searching that a slew of new companies see a business opportunity in helping people cut back. “Technology has evolved so quickly that we have spiraled out of control and nobody has stopped to think about how this is going to impact our lives,” said Kate Unsworth, the founder of a British company, Kovert, that also makes high-tech jewelry to filter out everything but the most urgent stuff. Many of these distraction-reducing products fall into the growing “wearable technology” niche. Smartwatches like the Apple Watch are designed to encourage more glancing and less phone checking. Last month Google and Levi’s announced plans for a line of high-tech clothes that will allow people to do things like turn off a ringing phone by swiping their jacket cuff. “If there is a chance to enable the clothes that we already love to help us facilitate access to the best and most necessary of this digital world while maintaining eye contact with the person we’re eating dinner with, this is a real value,” said Paul Dillinger, Levi’s head of global product innovation. Perhaps most radical is the NoPhone, a $12 piece of plastic that looks like a smartphone but actually does nothing. Van Gould, an art director at a New York advertising agency who moonlights as head of the nascent venture, said he and his partners had sold close to 3,200 NoPhones, which they market as a security blanket for people who want to curb their phone addiction but are afraid to leave home without something to hold on to. Even though many are doubtless bought as gags, “Most people don’t think about phone addiction as a real thing until you’re like, ‘O.K., they’re buying a piece of plastic because they are worried about their friend,’ ” Mr. Gould said. In the days before apps, you searched online when you wanted something, and that was that. But now that the Internet is increasingly mobile and companies are more sophisticated about tracking users’ history and preferences, technology is less about “pulling,” through Google searches, and more about “pushing,” through smartphone notifications that are impossible to ignore because they cause our phones to light up and go ding. Some products are trying to find a balance, like Google Now, a kind of digital assistant that uses data like location, Gmails and browsing activity to predict what a user might want next. Part of the idea is to bother you only when you need it. “If I’m about to forget my kid’s birthday I want the phone to scream at me until I do something about it,” said Sundar Pichai, Google’s senior vice president of products. This also makes business sense. The more people trust Google to navigate their lives, the more they’ll use apps like Google Calendar and Gmail. And the more Google understands its users, the more it can fine-tune its advertising engine. But smartphones are a potent delivery mechanism for two fundamental human impulses, according to Paul Atchley, a psychology professor at the University of Kansas: our quest to find new and interesting distractions, and our desire to feel that we have checked off a task. Like many of us, when Ms. Butler comes out of a meeting or a doctor’s appointment, she finds herself craving social media updates. She also had a nagging habit of opening a website, closing it, then opening it right back up in the hope that something new would appear. Addiction or not, it was enough for her to seek help from Ringly. Mr. Atchley, for one, is skeptical. Addiction is an intensely personal matter, he said, and successful treatment is about having the resolve to control our demons — not outsourcing them to message filters. In technology, as in life, a little willpower goes a long way. QromaScan is a simple scanning setup which might mean you finally get around to digitizing and organizing those boxes of old photos you’ve got gathering dust in the attic. The system, which is currently seeking funding on Kickstarter, combines the camera and voice recognition of an iPhone, with a green-screen lightbox to make it quick and easy to produce digital files of printed photos. We’ve all done it – taken a digital photo of a printed one because we can’t be bothered to scan it in properly. However, the resulting file typically suffers glare, is skewed, and lacks the digital tags to enable you to find it easily again. QromaScan attempts to address these issues by controlling the photo-scanning environment, while being able to scan and tag images in two to three seconds. Key to ensuring quality scans is the QromaScan Lightbox, a fold-away lightbox into which printed photos are placed, while an iPhone running the QromaScan app is positioned on top. Inside, 12 cool white LED lights provide illumination, while a chroma green material isolates the photo for automatic cropping. Because the distance from camera to photo is a constant, focus should always be spot-on, and voice control illuminates the risk of camera movement and makes scanning faster. Voice recognition is also used to tag images with metadata as the photos are being scanned. Users say sentences like “Qroma, the date is August 1st, 1957, the place is Honolulu International Airport” while the camera is taking a photo, and the right date and location tags are automatically created in the EXIF data of the image. 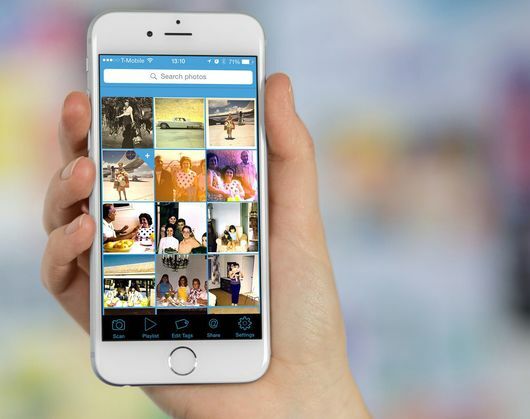 Names of people in the photos can also be logged as IPTC keywords, with the app able to recognize names in your contacts list, or manually-entered ones. The tags not only make finding images easy in the QromaScan app, but because the metadata is stored in standardized fields, they can be accessed in other programs like Lightroom and iPhoto. Basic editing is possible via Aviary photo editing tools, and a Back Scan function allows users to also record anything that’s been written on the rear of the image. While currently limited to iOS, an Android version of the QromaScan app is said to be in the works. QromaScan is currently on Kickstarter and has until May 31st to hit its target of US$20,000. An early bird pledge of $35 is currently enough to secure you a QromaScan Lightbox, though the price will rise to $40 and then $45 if those are snapped up. Should funding be successful, kits should start shipping in July. You can check out the Kickstarter video for QromaScan below. Apple famed as the world’s most secretive technology company, has accidentally posted photos of a new, unknown iPhone straight to its Apple Store website. Interestingly the shot comes as a direct result of Apple launching its new Lightning Dock with the last photo in the listing showing what appears to be an iPhone 5C, but one which clearly sports a Touch ID fingerprint sensor (old vs new comparison shot on page 2). Since the iPhone 5C doesn’t currently have Touch ID, it appears we are looking at its successor – possibly the heavily rumoured iPhone 6C. There is good and bad news about this. Such a phone suggests Apple is very likely to continue its so-called ‘budget’ C range and, in doing so, also continue with a range of 4-inch iPhones. This will please loyal fans who aren’t tempted by the ranges’ move to larger screens. Furthermore any new iPhone C model is almost certain to get a decent specification boost. 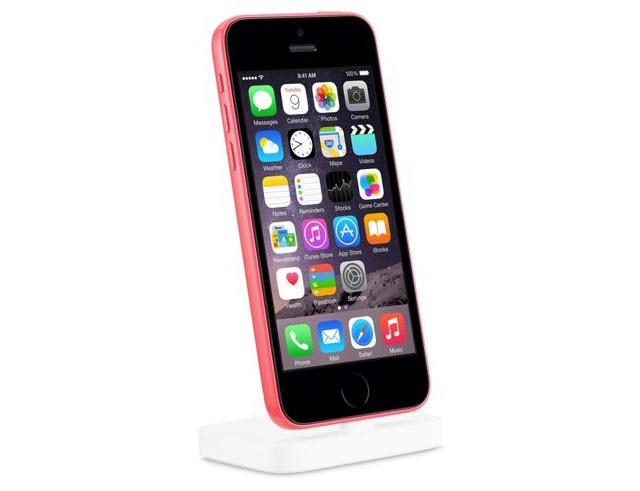 The current iPhone 5C is based on the discontinued iPhone 5, so it would make sense for the new model to be based on the iPhone 5S which delivers nearly twice the performance of the iPhone 5, an improved camera and jumps to a 64-bit chipset – uniting the current range. Perhaps even more important, in Apple’s eyes, is that equipping an iPhone 5C/6C with Touch ID provides greater security and opens up a new Apple Pay revenue stream (NFC seems a likely companion). In fact crowbarring new technology into devices is not without precedent at Apple. The company famously launched the 4th generation iPad in November 2012, just eight months after the third gen iPad. The only difference was generation four added the new Lightning port. As this is an annual refresh, we shouldn’t expect anything quite so cynical here. The flipside is that the continuation of the iPhone C range appears the final nail in the coffin to a fully fledged, premium 4-inch iPhone 6S (necessary camera boost et al). Such a move had been ruled out already by a number of credible leaks and reports from key Apple analysts, but it appears the future for 4-inch iPhones is as second class devices. A shame considering the logic I think a ‘small, medium and large’ (4-inch, 4.7-inch and 5.5-inch) high end line-up would make. So when can we expect Apple to launch these new models? Reports are they could receive early launches, though I think that would seem unnecessary given Apple’s current dominance of the premium market with the existing generation. 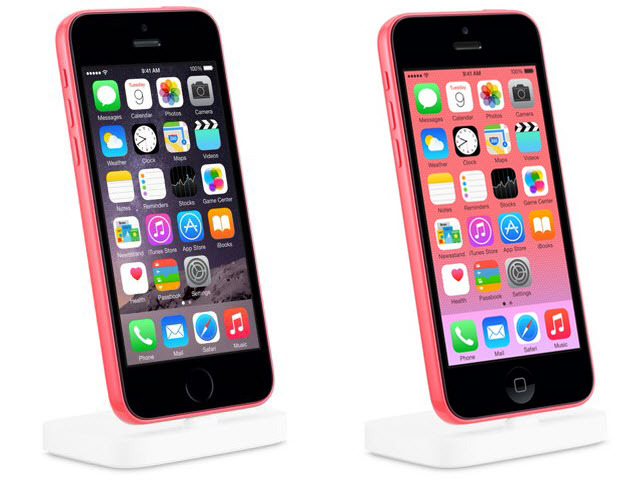 Update: Apple has now pulled the photo and replaced it with a standard shot of the current iPhone 5C. It chose not to discredited the photo, which traditionally is a strong sign of authenticity.